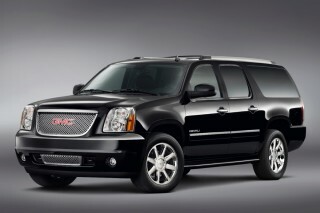 The Suburban LTZ's Autoride suspension is tuned for comfort--don't negate it with optional 22-inch wheels. 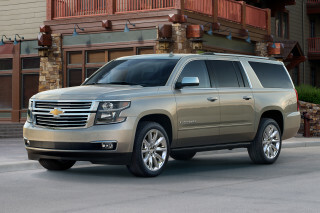 Plain but purposeful, the 2014 Chevy Suburban puts full-size SUV tradition to the foreground. Crossover vehicles suit drivers who ferry people more than cargo--but when it comes to towing and hauling more than the usual load, SUVs like the Chevy Suburban get the call. The Suburban, carried over for a brief 2014 model year before a new version arrives for 2015, is one of the most familiar SUVs in its niche. It's one of the longest, widest utility vehicles on the market, and fitted with all the available features, it can be one of the most capable, too. 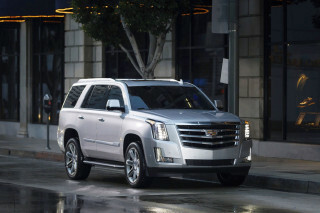 A relative of the GMC Yukon and Cadillac Escalade, Chevy's Suburban is essentially the extended-length version of the Tahoe. Some 20 inches longer overall, the Suburban has 14 inches more between its wheels than the Yukon, which amplifies its already vast cargo and third-row seating space. Most shoppers will be fine with the light-duty Suburban 1500, which comes with a 5.3-liter V-8 and six-speed automatic transmission, all good for 320 horsepower. 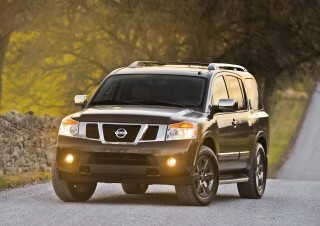 The drivetrain package is responsive and pleasant, shifting with smoothness and effecting kickdown shifts with urgency. Just because this is the light-duty option, that doesn't mean it can't haul; the Suburban 1500, when properly equipped, can tow up to 8,100 pounds of whatever you so choose. And thanks to a cylinder deactivation system that shuts of half of the cylinders when coasting or decelerating, it's quite economical, with EPA ratings of up to 15/21 mpg. Heavy-duty Suburban 2500 models maximize the Suburban's load capacity and towing capability, without changing the interior package, although they do have a stiffer, less passenger-approved ride. As expected, 2500-series models will also drink more fuel via its 352-horsepower 6.0-liter V-8 that prioritizes grunt over frugality. 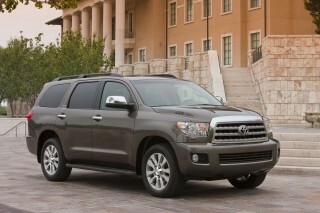 Handling isn't the priority in vehicles like these, but the Suburban's excellent ride quality is expected and delivered. 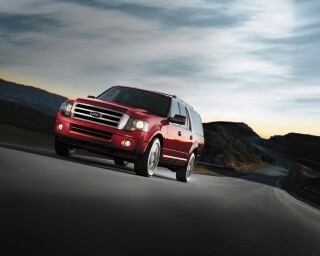 It's also confident on the road, and as maneuverable as any vehicle this size can be. The Suburban's interior has more good than bad points. The good: the amount of raw space available (137.4 cubic feet behind the first row of seats) would put some Japanese hotel rooms to shame. The simple, straightforward gauges are easy to understand and omit the high-end infotainment systems that lose drivers in translation. The downside of the Suburban's interior design is that, looking close at its trim, materials, and layout, it simply feels outdated. Thanks to its capacious interior, Chevrolet can offer the Suburban in a number of seating layouts, with different features, and covered in an array of materials. But one thing that can't be optioned is a third-row seat that folds flat into the floor. First- and second-row seats can be buckets or benches, while the third-row seat can be disappointing in that it's a folding bench that unfortunately doesn't go completely flat when it's not needed. 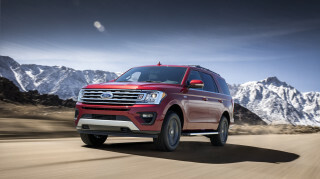 Unlike the one in the Ford Expedition, which can power-fold out of the way, this one needs to be removed entirely--but when you do it'll take two to move it, as it's so heavy, and then there's the question of where to keep it. 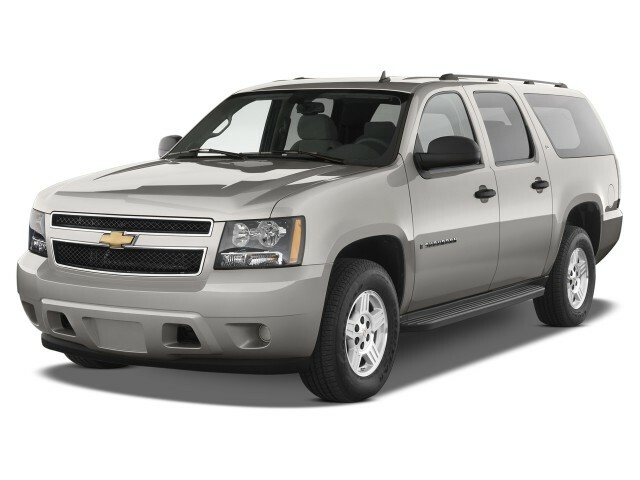 Properly equipped, the Chevrolet Suburban can seat up to nine passengers, with even some smaller adults fitting in the last row, though that space is ideally suitable for kids. 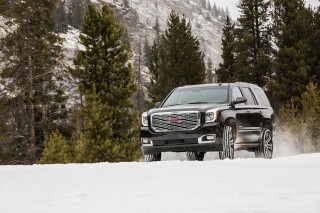 The Suburban is available in rear- or four-wheel drive. Bluetooth, cruise control, tri-zone climate control, and a six-speaker stereo with satellite radio and USB input are all standard. 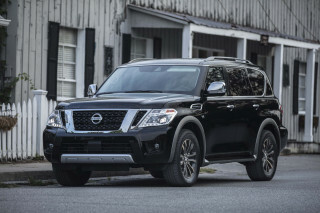 Moving up the model line, you can get a DVD-powered navigation system that has real-time traffic and is very easy to use; a rear-seat DVD entertainment system; Bose Centerpoint audio; leather upholstery; vented seats; second-row heated seats; and an Autoride electronic suspension. 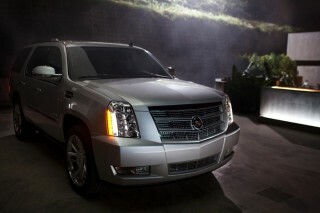 For more information, check out our review of Chevy's smaller offering: the 2014 Chevrolet Tahoe.